This post goes to Home Bakers Guild as part of Blogger Tuesday. I was here last week with an egg less chocolate cake and a story about my baking journey. 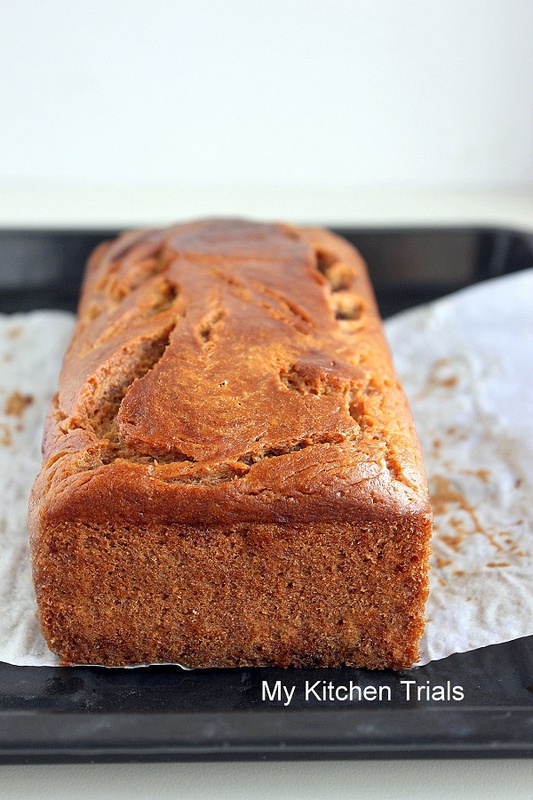 I am back again this week with a banana bread recipe and some more stories. Thanks for having me here again for the Blogger Tuesday. It’s been almost five years since I started baking and to this day, my interest (and my weakness) remains the same. Cakes. Coming to think of it, the only reason I started baking was to eat more cake. And some brownies too. I am getting friendly with the yeast guy only now as bread has never been a temptation. Main reason was failures from the past, but with the instant yeast that my husband got from abroad, the story is different now. Soft and spongy breads come out of my oven now, but still I remain faithful to my cakes. I love baking cakes, I love decorating it. But the problem is not that. It’s eating it. My man hates everything sweet and my kid hates food in general. So when a cake is left around, my sweet tooth is becomes more assertive than my common sense and I end up paying for my indulgence ‘inch by inch’. Literally! That’s where the guild helped me. It gave me this idea of baking the cake and NOT eating it. It gave me the idea that I could take orders! That way, I can meet my love of baking and decorating, but won’t have any other choice than to part with the cake when the customer comes calling for it. I haven’t gotten around working on the idea yet, but yet it’s firmly planted, thanks to this group. I love the immense talent here and I can spend a whole day looking at each and every creation. 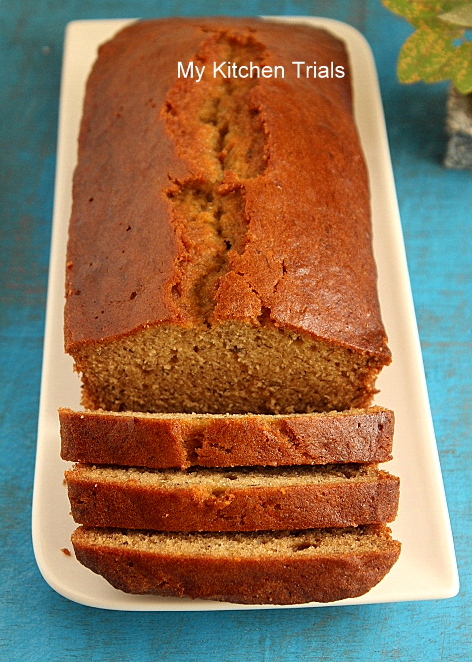 Coming to the recipe here, I wanted an easy to do recipe and this banana bread fits the bill perfectly. I bake it frequently. The first picture is an egg less version. The second one(blue background) has eggs and is almost fully whole wheat flour. I prefer the one with eggs (I always prefer egg in bakes). There was some left over melted chocolate which I swirled onto the top of the first bread. You can refer the notes to check out the variations. Preheat the oven to 180C. Grease and line a loaf pan. Mix/blend the bananas, oil, eggs,vanilla and yogurt together. 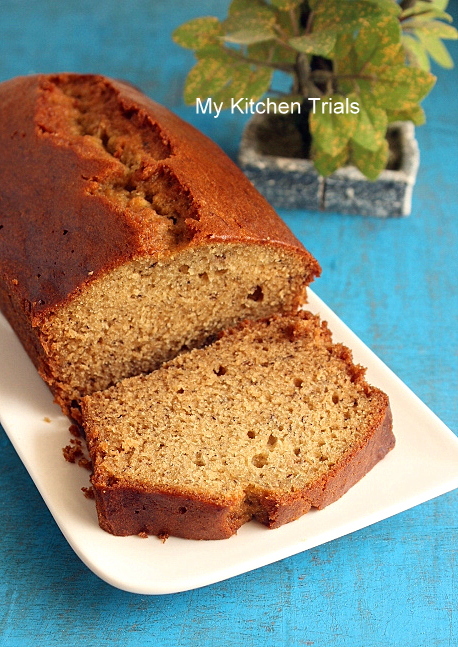 Whisk the dry ingredients – whole wheat flour(atta), plain flour(maida), baking soda in a mixing bowl. Combine the dry and wet ingredients gently until no lumps remain. Don’t over mix the batter. Stir in the chopped nuts, if using. Transfer to the pan and bake for about 60-70 minutes. Take it out from the oven once a skewer comes out free of crumbs when inserted in the middle. Flour can be plain flour alone or whole wheat flour fully or a combination of two. You can increase the sugar to 1.5 cups for a sweeter version or reduce it to 3/4 cup. You can replace the fat with applesauce (yet to try that though, but I read somewhere you can do this) or melted butter. The liquid can be milk, buttermilk or yogurt. You can add the eggs or skip them totally. In the latter case, if the batter is dry, add a bit of liquid. You can add melted chocolate, peanut butter, berries, tutti frutti, chocolate chips, nuts to this and bake.